Today's second episode of the Undisclosed Podcast focused on Hae's day on January 13, 1999 and tried to answer the question: Who was the last (innocent) person to see Hae alive? In the episode, we narrowed down the likely choices to Becky/Aisha and "Takera." But what if none of these people turned out to be the last (innocent) person to see Hae alive? And what if the last (innocent) person to see Hae alive were in fact the last person to speak with Adnan on his cell phone on the 13th? There's been a burning question for many fans of the Serial Podcast ever since they took their first look at the call log for Adnan's cell phone: Who is "Ann"? As you can see from Adnan's call log, the last call made or received from his cell phone on January 13, 1999 was a one minute, forty-four second call at 10:30 P.M. to "Ann." So, who is "Ann"? So, "Ann," Debbie, and Adnan usually went to the library to hang out during lunch/free period. This exchange might lead you to wonder how "Ann" learned that a sergeant got more evidence against Adnan after he was arrested. Well, here are the first six names on the State's interview list. The other five names should be familiar to all of you. Debbie was a friend to both Hae and Adnan, she was interviewed by police on January 28th, March 2nd, and March 26th, and she tesified at both trials. Krista was another friend to both Hae and Adnan, she was interviewed by police on March 1st, and she testified at both trials. Becky was a third friend to both Hae and Adnan, she was interviewed by police on April 9th, and she testified at Adnan's second trial. 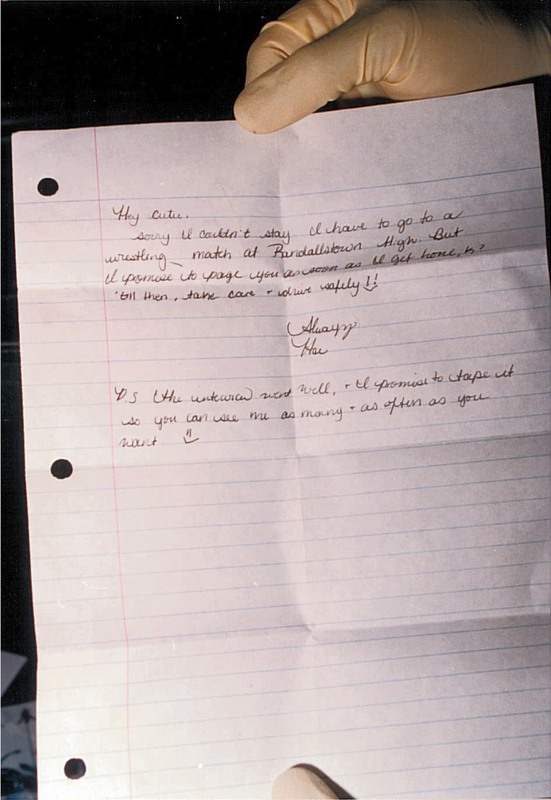 Aisha was Hae's best friend, she was interviewed by police on March 2, 1999, and she testified at Adnan's second trial. The second redaction in the above document is "Cathy," who was interviewed by police on March 9, 1999 and testified at Adnan's second trial. So, this answer might explain that last call on January 13th. Perhaps this was the call in which Adnan gave "Ann" his new cell phone number. Beyond that, Adnan explains how Ann was in the same A.P. Psychology class that he took with Hae, Aisha, and Becky. You might recall that Aisha and Becky both recall Adnan and Hae talking at or right after the end of that class, with Hae quite possibly/probably telling Adnan that she could no longer give him a ride because something came up and she had "something else" to do/"somewhere else" to be. Did "Ann" have a similar recollection? *** It's impossible to tell from the prosecution or defense files because the State apparently lost the notes from the interview with "Ann." They also lost the notes of the March 2nd interview with Debbie although there was the later recorded interview with Debbie on March 26th. There was, however, as far as we can tell, no subsequent interview with "Ann" by either the State or the defense. This leads to three possibilities. First, despite "Ann" providing information in her interview that was helpful to the State, she was never interviewed again by the State. I think we can all agree that this is exceedingly unlikely. Second, "Ann" had nothing meaningful to say, which is why she was never contacted again after her initial interview. It's always a possibility, but it's tough to imagine "Ann" having nothing useful to say despite being in that A.P. Psychology class, talking with Adnan at the end of the day on January 13th, and "usually" hanging out with Adnan in the library during lunch. Third, "Ann" told the police something that was harmful to the State's case. Maybe she heard Hae telling Adnan she couldn't give him a ride. Maybe, like Debbie, she said that she saw Adnan after 2:36 P.M. Or maybe, also like Debbie, she said that she saw Hae after 2:36 P.M. In fact, maybe "Ann" was the last person to see Hae alive. At this point, all we can say is that (1) we have no idea what Ann told police on March 2nd; (2) we have no idea what happened to the notes from that interview; and (3) we have no idea why there was (apparently) no follow-up with Ann. **** That said, like "Takera," she will be contacted. And if she remembers telling someone from the State something that was helpful to Adnan's case back in 1999, well...there could be a very good argument for a Brady violation. *This is complete speculation, but one reading is that Aisha and Ann were both interviewed for about 55 minutes, with a 30 minute lunch break from 12:00-12:30. Or maybe the interviews were shorter, with longer gaps between them. **The second redaction is personal information about Ann that is unrelated to Adnan's trial. ***The likeliest person to have a similar recollection would be the person who sat right next to Hae in A.P. Psychology; more on her later. ****That goes for the defense as well. This appears to be another huge blunder by Adnan's trial attorney. The State put Ann as #2 on their interview list, interviewed her 2 days after Adnan's arrest, and then told the defense that it had lost the notes from her interview. If you're defense counsel and later realize that the State is not going to call Ann as a witness, don't you get someone on your team to talk to her to determine why the State dropped her? At worst, she has nothing of value to say. At best, she could make your case.
" Second, "Ann" had nothing meaningful to say, which is why she was never contacted again after her initial interview. It's always a possibility, but it's tough to imagine "Ann" having nothing useful to say despite being in that A.P. Psychology class, talking with Adnan at the end of the day on January 13th, and "usually" hanging out with Adnan in the library during lunch." Why does her being in class with him mean in any way shape or form that she knows something? Why do you continue to raise suspicions about people at most tangentially related to this thing and, speculate wildly about what they may or may not have said rather than actually determining first if they know anything on any import? FInally, why does Rabia think that the release of public documents means there is a "leak?" They are publicly available documents after all. (I know you cant answer that last one). Also, y'all have yet to tell us why it is important if Takera or Ann or whoever else at the school is the last (innocent) person to see Hae alive. What is the point? So the police never looked at Hae's pager records? Even for the month she was missing? Wouldn't her family have asked to look at these to get some idea of where she might've gone? I don't understand this at all. Also, could the defense have ever gotten these records independent of the police? theghostoftomlandery: If "Ann" had nothing meaningful to say, why not just send the defense a note indicating, "'Ann' had no relevant recollection of January 13th"? I'm certainly open to the possibility that "Ann"said nothing meaningful, but the loss of the notes of her interview does raise suspicion. Sassy: I need to learn more about getting pager records back in 1999. But we do know that the State never got them. Interesting. I always thought Ann was Anjali, the other girl Adnan was kind of flirting with. Apparently this was his classmate? Does Krista know who Ann is? Good grief, I thought I was maybe unhealthily interested in this case, how do you manage to always be the first to comment ghostoftomlandry? Do you just refresh this page constantly all day? Professor, I think it likely that there were no pager records to be obtained that would be of any use. If Hae had a one-way pager, they do not leave a paper trail; making them superior for privacy purposes than cell phones. 1. In the podcast this week, you state because the wrestling match did not take place on the 13th, Inez’ recollections must be incorrect. But, it actually sounds like her initial recollections WERE correct. Perhaps her recollections changed based on police interference or perhaps all the gossiping about the case influenced her actual recollections and she began to doubt herself and change her answers to mesh with others interviewed. 2. In regards to the clock in the gym, my school had the exact same clock and it was always incorrect during a good portion of the year. Due to the bars around the clock and the height of it, our custodians never corrected the clock for daylight savings time. So, if the clock said 10:30 am, its possible when it was time to “fall back” no one changed it and it was really 9:30 am. Do we even know for sure she had a pager in mid January 1999? Her brother testifies that "she used to" but that isn't explained what he means by that. Adnan called her house 3 times the night before, why wouldn't he be paging her? applesauce: 1. Fair point. Inez might have the right day, with the wrestling match being planted in her memory later. If she's right, though, it doesn't really change the Becky timeline, which has Hae heading to her car at about 2:20. The big deal about there being no wrestling match is that it removes Summer from the timeline, making Asia more important. 2. You're right. The clock could be wrong. But, in either event, students in Hae's 2nd period class should have remembered her filming that day. monstimal: Good point. Young's testimony does raise that possibility. I hope we can find more evidence to be able to say more clearly whether she still had her pager. It appears that there’s solid proof that the taped interview with WHS athletes occurred on Jan. 13th. The police interviewed Woodlawn’s athletic director Ralph Graham on Feb. 22nd/99 at Woodlawn HS (no doubt in his office).Graham told the police that on 1/13/99 at 0900 hrs he had several student athletes in the athletic wing for a meeting with cable channel # 36 because they were going to be interviewed. Graham indicated that HML was one of the students present. He says the interviews[s] started at approx. 0900 and concluded at1300 hrs. Graham says he last observed the victim approx 1300 hr. (after the taping sessions were finished.) LAST observed. Graham knew HML well and there is a video of him speaking about her after the news broke that she had been found. Ralph Graham is a very solid source; he was overseeing operations and he remembedr the last time he saw Hae. Are there any police reports or info from anyone in Hae's family confirming she was supposed to pick up a cousin (or relative) after school on January 13th? What event, or lack thereof, made Hae's family file the missing persons report in the first place? Was it because she didn't show up to pick up her relative or for another reason? Clearly it wasn't because she didn't show up for a wrestling match or work since not enough time had passed by the time the police called Adnan at 6:30 to notice she hadn't shown up at work or a wrestling match. Badger: Graham actually says he saw Hae at 13:30 (1:30) after filming. He's definitely solid evidence that Hae was filmed on 1/13, but...we know from Hae's note that she filmed her piece on the same day as the Randallstown wrestling match, which was on 1/5. Unless there's some unreported 2nd match at Randallstown on 1/13, the filming was on 1/5. K-Rae: Hae's family called the police at about 3:30 after she failed to pick up her cousin on 1/13. Thanks Professor, and thanks for the correction. Well, that's just it, the note. Graham is solid evidence; But the lack of newspaper reportage of scores, is not solid evidence that there was not some sort of wrestling event taking place at Randallstown that Hae was going to score. Badger: But there was newspaper reporting of (1) Woodlawn wrestling matches on 1/5 and 1/12; (2) a Randallstown wrestling match against another school (not Woodlawn) on 1/13; and (3) a Woodlawn basketball game on 1/13. Collectively, that's pretty strong evidence that there was no Woodlawn wrestling match (and certainly not one at Randallstown) on 1.13. Professor, sorry, I don't see that as evidence. Newspaper reports or rather a lack of them are not proof that something did not happen. As someone who has worked for newspapers, I can tell you that scores for high school wrestling meets are way, way down on the priority list. Results can be omitted for all kinds of reasons, they were called in too late to make press or never called in! Or, someone lost the fax that was sent in. Or, there simply was not enough space that day due to other events taking priority. Someone at reddit came up with the intriguing theory that Hae may have had the responsibility of calling in the scores. Woodlawn wrestling matches on 1/5 and 1/12; (2) a Randallstown wrestling match against another school (not Woodlawn) on 1/13; and (3) a Woodlawn basketball game on 1/13. True, this appears odd. (The basketball game has nothing to do with this, so discounted.) It is possible that there was some sort of anomoulous situation with the wrestlers on 1/13; It's possible, the newspaper report for the 1/13 Randallstown wrestling vs another team was an error and it was Woodlawn and not this other team. This happens ALL the time when newspapers are rushing to press. The error could have been corrected the following day, or it may never have been because no one reads these things. So let's say the match on the 13th never happened; how can the author of a note write about a match that was to happen on 1/5 and write about an interview that "went well" but is in the future? What is the answer to that problem? And I don't believe that Hae was taped two weeks in a row for the same program. And I don't believe that Graham would get his dates mixed up in the six weeks, or whatever length of time elapsed after the event —when he is in charge of the program, he has a calendar, he's a responsible adult and the police are looking for very specific answers re his last sighting of a victim who was well known to him. What I'm confused about, which has not been confirmed, is why was the police involved so quickly? I mean typically to file a missing persons report they have to be missing for 24 hours. I find it strange that it became that all of a sudden because she didn't pick up a cousin. So it is possible that this interview is not the one referred to in police statements? PS might WMAR have knowledge of when it was filmed or aired? Is it correct that the TV report aired on the 13th? This may not leave much time for editing if filming finished at 1pm. Is there someone who could provide information about how TV pieces such as these were produced in 1999? That's good enough for me. That said, if there was a wrestling match on 1/13, that makes it very likely Debbie is remembering the right day, creating an even bigger problem with "Takera." Anonynon: I think it replayed on ABC. We're trying to get more info from WMAR. Seussical: We're not sure when it originally aired. I have a question about the reference to the "interview" in Hae's note to Don - how do we know for sure that she was speaking of the Ch. 36 interview? Is it possible she was interviewing for another job? Another academic program? Anything else that may have been on her radar? I know you guys are scrutinizing the details quite a bit and perhaps I've missed this but it seems everyone has assumed that the interview must be Ch. 36 and I'd like to understand that better. Thanks. Hae discusses taping the interview so that Don can watch it. So, this would have been a TV interview, not an interview for a job or academic program. Thanks Professor; I note that the court finds newspaper articles "trustworthy" which is... I will refrain....Newspapers are not fact-checked due to deadline pressure and newspapers are prone to error for the same reasons. As anyone who reads newspapers regularly is aware, there is a corrections section in most major newspapers of record. At any rate, using the absence of a newspaper report to t prove an event never happened is not the same as using the presence of a newspaper report as additional material to prove that an event did in fact occur. I rest my case.